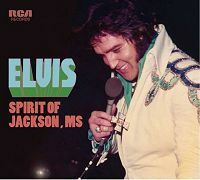 A double CD release containing two soundboards from Jackson, Mississippi. The first show has been bootlegged several times, and even contains songs featured on FTD latest double CD release, Hometown Memphis. We are talking about the June 9 show from 1975. A standard "June 1975" concert, with no real highs or lows (CD-2). The concert comes in good sound quality! The second show (CD-1) is from September 5, 1976 and is said to originally be planned for A Golden Celebration Box in 1984, but Joan Deary's idea was axed before release. Some tracks from this show have been out in rather poor sound already, but the FTD release has the complete show in great sound. A rather good concert from Elvis giving the time. You can tell already from 'See See Rider' that it will be something extra this evening.